I’m delighted to include this expert and informative post by Steven Robb. Steven is Deputy Head of Casework for Historic Environment Scotland. With qualifications in building surveying and urban conservation, he has a particular interest in early and interwar social housing in Edinburgh, and how new housing was incorporated within the historic city. Throughout the latter nineteenth century Edinburgh’s population expanded greatly. Although some new working-class housing was provided within the inner suburbs (1), many of the poorest still occupied badly converted tenements in the overcrowded medieval Old Town and Southside. Although historically uncommon in England, most working-class urban Scots (and many of the middle classes) lived in tenements. Unlike the numerous small rooms of the terraced house, tenements often had large rooms, but for the poor there were fewer of them, including many one-room houses or ‘single-ends’. In the early 1890s council housing for the poor was promoted by a Liberal City Councillor, John MacPherson, a churchgoer and temperance hotel owner. At a time when a hundred families in the city actually lived underground (in vaults), MacPherson railed against the ‘thirty or forty thousand people’ living in one-room houses. In 1893 the city instituted a major Sanitary Improvement (or slum clearance) scheme under the provisions of the 1890 Housing Act. It involved both sensitive ‘conservative surgery’ of historic buildings in the Old Town by proto-town planner Sir Patrick Geddes (2) and small reconstruction and new-build schemes by the Burgh Engineer, John Cooper. Cooper’s new housing was often a sanitised version of the traditional tenement, utilising deck-access balconies for light and ventilation. He designed a new street layout in Stockbridge and several projects around the Old Town, one of the earliest being High School Yards (1896-7). Here, two sandstone (3) tenements containing thirty-two small flats, costing £200 each were built, unusually with shops underneath. The Council’s housing developments were, at least partly, responsible for significant improvements in health. In the High School Yards area alone, infant mortality figures fell from a horrific 247 to 39 per 1000 in only a decade and, between 1892 and 1910, death rates fell from 53.7 to 12.4 per 1000. One of the first developments was High School Yards in the overcrowded Old Town. Two linked Scots Baronial five-storey sandstone tenements with rear deck access balconies. Despite compensation payments costing almost as much as the new housing itself, the Council provided around 750 houses before the War. Output increased significantly following the 1919 Housing Act with its generous State subsidies. In the following decades there would be reconstruction and infill schemes in the historic city, and new housing on peripheral greenfield sites or underused suburban land. (4) Initially, housing was either ‘general needs’, or improvement (slum clearance) housing at lower rents. The Council were quick of the mark, with City Architect James A Williamson’s Chesser scheme prepared before the Act had passed. He primarily used the flatted block, a peculiarly Scottish hybrid between cottage and tenement consisting of four flats under a hipped roof. Two ground floor flats were entered from front gardens with upper flats accessed from the sides or central close. Their relative scale allowed them to address the lower density layouts advocated by the garden city movement. The mini-tenement. A flatted block, designed by Campbell in the early 1920s. This form, used throughout Scotland, were also known as ‘cottage flats’ or commonly as a ‘four in a block’. The central door is an open close to the upper flats. Images courtesy of Edinburgh City Archives. 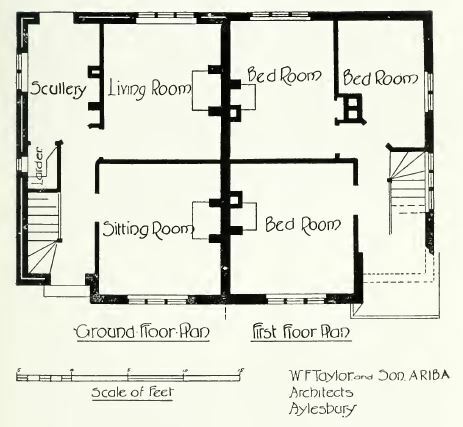 Besides Chesser, in April 1919, the Council had held a competition for private architects for four housing sites, two of which progressed in 1920. The Wardie scheme, planned by architects AK Robertson & TA Swan, was carried out according to garden city principles. It largely contained cottages and flatted blocks within geometric tree-lined streets with grass verges and cul-de-sacs. Rendered concrete blocks were used instead of bricks to save costs. The second development was Willowbrae /Abercorn, by Fairlie, Reid & Forbes. It successfully mixed tenements, flatted blocks and cottages together in a meandering characterful plan using brick, roughcast and solid stone walling. The housing was high-quality and well-designed but had been both expensive to build and to rent. It also didn’t cater for the poorest in society, this not being an intention of the Act. Edinburgh built around thirteen hundred 1919 Act houses, but high costs resulted in the State withdrawing its provisions and building ceased until after the 1923 and 1924 Acts. However, the new Acts encouraged standardisation and prefabrication to lower costs, with design or material extravagances met by Councils not the State. In Edinburgh, this immediately resulted in cottages being phased out, less bedrooms and plainer, cheaper finishes. Campbell quickly realised Edinburgh’s housing problems would only be served by higher densities and returned to tenements, officially discouraged but not forbidden. In October 1923, he designed a new three-storey example for Leith, followed by a cheaper standard tenement which could (almost) be built to garden city layouts or linked into terraces. He also designed two standard patterns of ‘four in a block’ housing for peripheral estates. Campbell focussed on cost-cutting and delivery by whatever means, including, in 1925, the experimental use of Dutch Korrelbeton (no-fine-aggregate) concrete which was cheaper than brick and required only semi-skilled labour. He also sanctioned outsourcing, approving 1000 Duo-Slab concrete and brick houses from the private contractor, WM Airey of Leeds. With his engineering eye, he also trialled flat-roofs, timber and steel construction and reintroduced deck-access balconies to some tenements. Standard tenement and a first floor plan. Living rooms were 13ft6” by 14ft3½”. Finished floor to ceiling heights were 8ft 6”. Figs in circles are square footage. Images courtesy of Edinburgh City Archives. Campbell provided around 4500 houses (built or planned) but worked himself ill with his two jobs, and 16 hour days. On medical advice he refused a two-year extension as Housing Director alone and retired early in June 1926. Anderson finally got his way when Edinburgh’s recently-appointed City Architect, Ebenezer James MacRae (1881-1951), absorbed the additional housing role. Politically, the same year MacRae took charge, Labour first emerged as a force in the city, and to counter this, Edinburgh developed a loose anti-socialist coalition of Tories and Liberals termed the ‘Moderates’ then ‘Progressives’. Although proficient at slum clearance housing, they would be lukewarm in supporting general-needs housing, considering this was the role of the private sector. Despite railing against public spending they were content to directly loan or subsidise private builders who constructed over 11,000 houses for rent or owner-occupation between the wars, continuing support even after beneficial subsidies were removed. (8) This position was vindicated by central Government who withdrew general needs subsidies between 1933 and 1935, the focus moving solely to slum clearance and overcrowding, addressing the very poorest in society. In post, MacRae immediately cancelled Campbell’s experimentation, returning to traditional masonry construction with pitched slate roofs. His direct control of housing was music to the ears of Edinburgh’s trade unions who had opposed Campbell’s involvement of the private sector, semi-skilled labour and moves away from separate-trades tendering. Whitson Crescent (1932) MacRae’s first feature crescent, showing brick before and after roughcast. Note the horizontal stone banding at first floor level. Image courtesy of Edinburgh City Archives. Like Councillor MacPherson, MacRae was a religious man, the son and grandson of Free Church of Scotland ministers. He had a charitable view of humanity and a strong desire to provide the best housing possible to help tenants better themselves. His horror of overcrowding gave him a healthy zeal for daylighting. Although subsidies favoured brick, covered in roughcast for Scotland’s climate,(9) in the historic city MacRae made a special effort to build ‘in keeping with surrounding buildings’ and, where possible, built solid stone walls for frontages and visible gables. The Pleasance (1934-8) Solid stone tenements and shops. Differences in building planes, storey heights and tall chimney stacks add interest to the composition. Where Campbell and MacRae may have differed on their rehousing methods; Campbell favouring quick fixes against MacRae’s concentration on quality, both shared a desire to see tenants housed near their workplaces. MacRae also saw tenements as the answer but his use of denser developments, even on peripheral sites, sometimes failed. At Niddrie Mains, a slum clearance estate on the very edge of Edinburgh, 2000 houses were built, entirely with three-storey tenements together with (literally) a handful of shops and other amenities. (10) It never really prospered, but Prestonfield, built at the same time, did, perhaps because it had a careful mix of tenements and flatted blocks, and was nearer workplaces and established communities? The rear of a Niddrie Mains (Craigmillar) tenement prior to demolition. Traditionally built, they would have been simple to refurbish, but the area’s bad reputation led to around 2000 houses being demolished without public consultation. The Department of Health were still wary of subsidising tenements, especially those over three storeys, and several schemes were delayed or had to be redesigned. However, MacRae persevered, and in the year ending 1936 had delivered over 1100 houses, 88 percent of which were within tenements. MacRae’s team first used Campbell’s standard pattern housing for peripheral work, including his flatted blocks, which MacRae saw as a compromised ‘English’ solution. However, in the early 1930s he expanded his repertoire, introducing new designs and layouts with some influence from Europe, the fruits of his numerous continental trips. These culminated in his influential role in the Highton delegation, which led to the Report on Working Class Housing on the Continent in 1935. However much MacRae may have admired the planning and ambition of contemporary European housing, he disliked the austerity of international modernism and found fault with their flat roofs and cantilevered balconies. He considered four-storeys high enough and found the ‘Germanic’ communalisation of services and amenities unsuitable for Edinburgh. The Report on Continental Housing, together with the 1935 Scottish Architectural Advisory Committee Report, did, however, lead to change. MacRae shared the Report’s desire for less-drab layouts and better architecture, together with enhanced community facilities. Royston Mains Crescent (1935) The only inter-war Council housing built in facing brick, a direct result of the Highton Report. It followed the 1935 Housing Act’s desire for two-storey 4 apartment (3 bedroom) family houses and utilised MacRae’s signature banding at first floor level. Linear street block on Gorgie Road (1936) enhanced with projecting stone elements and canted bays. Every ground floor flat had a garden with shared spaces to the rear. MacRae’s last major developments include Piershill (1938) and West Pilton (1938). Piershill, arguably his masterpiece, used a near-continuous snake of three and four storey, largely stone, tenements angled to address its south-facing site. It was European in plan but unashamedly Scottish in design. On the city’s periphery, the plans for West Pilton comprised 2000 houses and proper community facilities, with a giant circus ringed with stone tenements as a centrepiece. Sadly, war intervened, with timber unattainable and bricklayers lost to defence work. Work recommenced in 1942 to a greatly diminished specification and much increased cost, but space for promised community facilities was seized for temporary housing. By the time of his retirement, in 1946, MacRae had delivered around 12,000 houses, as well as important studies on Edinburgh’s historic buildings, a precursor to the listing system. His departure came just as subsidies for private housing were discontinued and council housing gained the ascendancy (12), but it also saw the end of the authority and power of the City Architect, with the first major post-war housing estate being offered to open competition. Title: ‘Health is greater than history’; this 1923 quote from Adam H Campbell represents the conflict between providing new housing and the loss of historic buildings in the city during slum clearance. (1) Including the wonderful ‘colony’ developments of the 1860s onwards by the Edinburgh Co-operative Building Company throughout the city. (3) Many of the developments, in less visible positions were built in brick covered in roughcast, or harling in Scots. It was a wet-dash render finish normally, and unfortunately, coloured grey to cope with air pollution. (4) Often old aristocratic estates, hutment ground or, with consequent disquiet, golf courses. (5) Anderson’s mood likely darkened further when Glasgow appointed a Sanitary Engineer as their Director shortly afterwards. The City Architect would also have been upset, especially as his Chesser scheme was seen as an exemplar. (6) Brooks Avenue (1902) in East Ham. He designed two magnificent Carnegie libraries now both listed. (7) Over 100 tenement flats were reconditioned under the 1919 Act, with the full costs of works being met. Although Campbell’s intention was to provide quick cheap housing, many of the tenements were of great historic interest and he essentially saved them by his intervention. (8) These houses often differed very little from their Council counterparts. (9) Bare brick wasn’t seen as able to cope with the Scottish climate, and in any case there wasn’t a stock of good bricklayers for facing brick – which was expensive and hard to get hold off. (10) Niddrie Mains, often referred to as Craigmillar, was demolished in the early 2000s – It is now being rebuilt, ironically, in tenement form. (11) But possibly closer to home. An C18th Edinburgh mansion has horizontal banding at first floor. (12) Two thirds of houses built between 1946 and 1960 were social housing, reversing the inter-war ratio. John Frew, ‘Concrete, Cosmopolitanism and Low-cost House Design: The Short Architectural Career of AH Campbell, 1923-1926’, Architectural Heritage V (1995), p29-38. 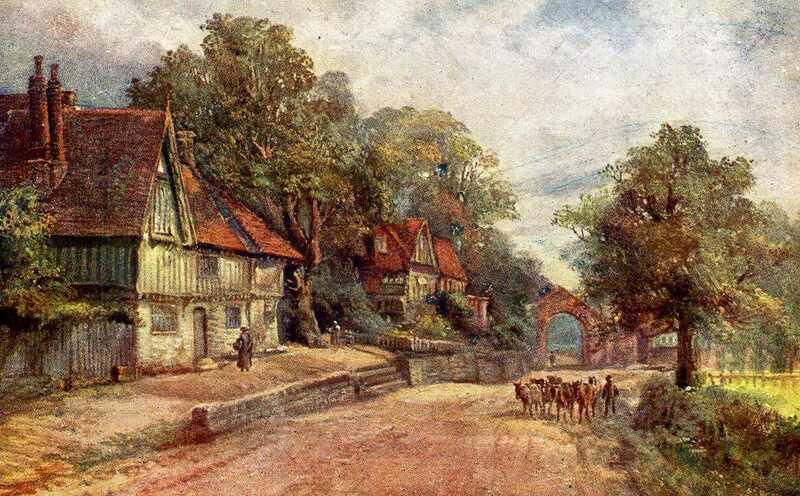 Having recently visited Penshurst, I’m able to include some better images of the original Pioneer Cottages and a little more history and illustration of later developments. Escombe seems an unlikely hero of housing reform. Born in India in 1839, the daughter of an official of the East India Company, she lived in Penshurst in an all-female household as a lady of independent means. Still, she was a more radical figure than this conventional façade might suggest. She had been an accomplished artist in her younger years, exhibiting several times at the annual shows of the Royal Academy. (2) And when the 1894 Local Government Act created elected parish councils and rural and urban district councils and permitted women to serve on them, she secured election to the village’s new parish council. That motion was rejected and, in any case, the Parish Council had to secure permission from higher authorities. In the following year, however, backed by local GP Louis Wood, the Parish Council called upon the Sevenoaks Rural District Council to support their demand. To press the case, the Parish Council conducted a survey of employers and workmen regarding local housing needs. It concluded 20 new houses were needed to accommodate local families without homes of their own. In response, the District Council first canvassed local landowners on their willingness to build. As low-rental working-class housing was not – then as now – of interest to profit-driven private enterprise, the response was negative and the Council had, reluctantly, to accept the necessity of council building. It had first, however, to prove the need by means of a public inquiry. The March 1897 inquiry also concluded the case proven and the District Council followed the next step of this laborious process by applying for permission to build from Kent County Council. Four months later, approval was granted but the District Council dragged its heels until – under the continued prompting of Miss Escombe – a joint committee with the Parish Council was formed to forward the process. Wood and Escombe (its honorary secretary) were members. Our village is one of the most beautiful in Kent, full of picturesque old buildings and cottages; to build brick boxes with slate lids would have been desecration. Sixty architects rose to the challenge but, while they reckoned ‘the erection of three pairs of pretty dwellings’ would cost £1140, the lowest builder’s estimate came in at £1729. Eventually, a lower estimate of £1463 was secured and the Parish Council applied to the Local Government Board for approval of a loan of £1800. After a third enquiry, this was granted but construction delayed until an adequate water supply guaranteed. A well was sunk and water pump supplied. In fact, Wood and Escombe went further, securing in 1902 the village’s first piped water supply with a reservoir built by the Parish Council, also at Smarts Hill. Finally, construction began in November 1899 and by December the following year the aptly-named Pioneer Cottages were built and fully occupied. They contained two ground floor rooms with a separate entrance and hallway and an extension to the rear containing a scullery and washhouse with three bedrooms on the second floor. At this time, separate earth closets were provided at the back of the houses. This high-quality accommodation came at a price – a rental of 5s a week which Escombe candidly acknowledged was affordable only to ‘the higher class of workmen’ but she hoped – as was typical among housing reformers of the day – that a trickle-down effect would occur and that ‘they would move into our better cottages and leave theirs at a lower rent to the agricultural labourer’. 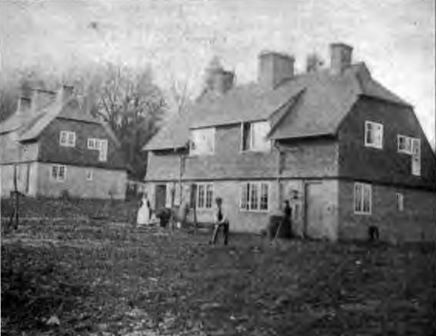 Escombe’s efforts were rightly celebrated – Sidney Webb himself commending ‘the energy of a lady councillor’ which had secured the Penshurst housing – and she became an acknowledged housing expert and campaigner. (5) She died, aged 64, in 1905 ‘loved and honoured’, her memorial tablet states, ‘by those to whose welfare she ministered with untiring zeal, sympathy and devotion’. It behoved women, now that the privilege of serving on public bodies was granted to them, to use that privilege; they had more leisure than fathers, brothers and husbands and ought to work: sanitary matters appealed especially to them and the housing problem was at the root of all sanitary reform. Badly built, badly drained, insanitary houses led to disease, to the spread of infection, and to lessened vitality. Lessened vitality in its turn tended to the liability to fall an easy prey to disease and the drink habit. On children, bad housing had the most serious physical, mental and moral effects, and this from a race point of view was most harmful and damaging. I’m sure the many working women of her day did not enjoy such greater leisure – in fact, they were probably working a double shift – and some of her concerns reflect a typical Victorian preoccupation with working-class morality. That uncomfortable reference to ‘race’ echoes the pre-1914 discourse of National Efficiency – a eugenicist concern, which united many on the left and right, with the fitness of the British working classes to work and, if necessary, fight in a world perceived (rightly as it happens) as more competitive and threatening. 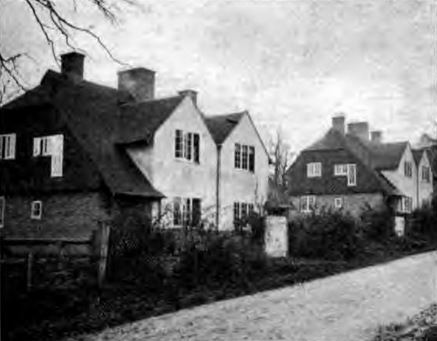 After Jane’s death, her elder sister Anne – in what looks like a local variant of the Octavia Hill method – collected the rents of the cottages for the Parish Council. She was proud to claim in 1907 that the cottages had been continuously occupied and only six weeks’ rent lost throughout and that only when tenants had changed occupation. The tenants mostly live in what we meant for a scullery, but has now become a small living room, the larger room being used only occasionally. Otherwise, the cottages are, I think, satisfactory. ‘We should plan differently now’, she concluded, and that revised plan was presumably implemented in a second scheme of eight cottages let at lower rents built before the war. The Warren Cottages formed the nucleus of what became a larger interwar council housing scheme at Glebelands. This image shows both the original and later council homes. In the interim, there was further development on Smarts Hill with what looks like an interwar development of three semi-detached pairs and one short, three-house terrace immediately to the north of Pioneer Cottages towards Penshurst itself. These homes are notable for their tile-hung first floors – a clear homage to the local vernacular and quite a common feature of council housing in the area. At Glebelands, the post-war estate, the homes are the ‘brick boxes’ that Escombe decried but they are attractively laid out amidst spacious gardens. The sheltered housing at Forge Close in the village itself is also post-war but thoughtfully designed to fit into its historic surrounds. There’s a lot of council-built housing for older people in the countryside. It reflects, presumably, the financial regime operational after 1954 when central government support was limited to slum clearance redevelopment and homes for the elderly as well as the particular needs of country people often dependent on tied housing linked to their employment during their working lives. 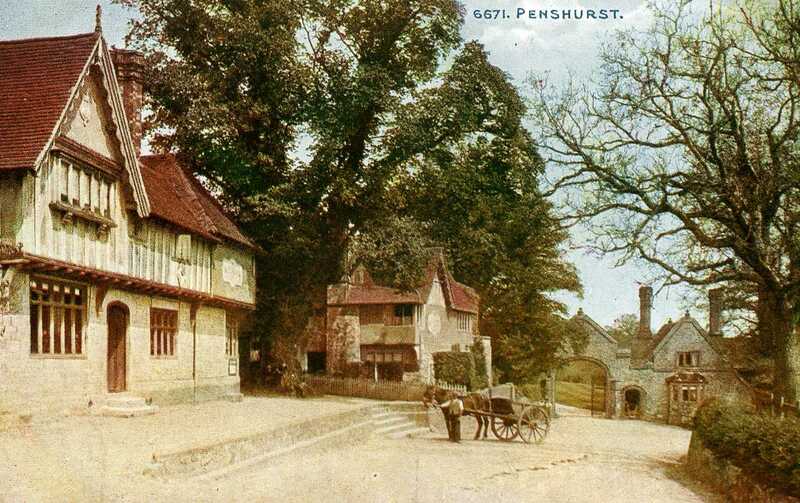 High property prices and a predominance of privately owned homes means that some local people are unable to afford a home in the parish of Penshurst. At the time of writing the report the cheapest property available was a 2 bedroom house for £295,000. For a first time buyer to afford to buy this property a deposit of approximately £44,250 is required along with an income of approximately £71,643. It found 15 households – including 10 in unsuitable privately-rented accommodation, three who were sharing and one in tied housing – who needed some form of social rented housing or shared ownership. 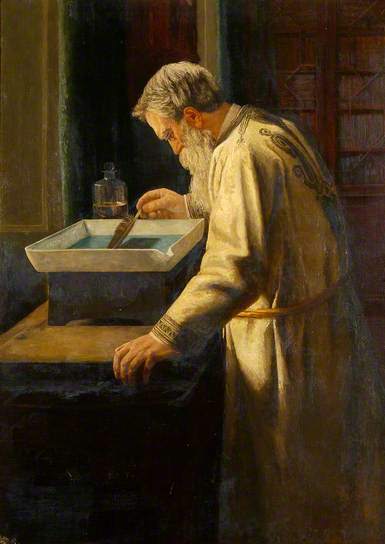 (2) The portrait above was exhibited at the Royal Academy in 1877 and features Edwin Edwards who had married Jane’s sister in 1852. It is wrongly attributed on the BBC Your Paintings website to Jane Esmond. (9) See, for example, Andrew Motion, ‘Forget Shoreditch: It’s our rural villages most at risk from gentrification’, Daily Telegraph, 26 October 2015. The Rural Housing Alliance published Affordable Rural Housing: A practical guide for parish councils in December 2014.